Rating: B/ Oh, Franklin. you should have worn the damned condom! Okay, so maybe Eva Khachaturian wasn’t meant to be a mother. But is she responsible for making her son a monster? Society seems to think so. In the wake of a horrific attack orchestrated by Kevin, a sadistic fifteen-year-old psychopath, Eva (Tilda Swinton) is heckled on the street and sometimes outright attacked by people who lost their loved ones in the tragedy. In a swirl of fever dream-like memories, past becomes present, and Eva remembers when her husband Franklin (John C. Reilly) and kids Kevin and Celie (Ezra Miller and Ashley Gerasimovich) were still with her. Eva never seemed to really want Kevin, a vile, evil, perpetually incontinent child turned killer teen who mind-fucked his mother from a very early age, but the real question is whether Eva could stop the direction her son was going. Franklin, a happy guy in denial of Kevin’s true nature, condemns Eva for not connecting with her little moppet, and Kevin simultaneously gaslights Eva and turns Eva and her well-meaning but dopey husband against each other. Kevin might seem like a child of Satan or some other supernatural incarnate, but really he’s like thousands of other children in the world who really don’t seem to have a conscience- and who better to blame than the boy’s own mother? Anyone who has seen filmmaker Lynne Ramsay’s Ratcatcher knows she has a propensity for both beautiful cinematography and grueling bleakness. We Need to Talk About Kevin, based on the best-selling novel by the same title by Lionel Shriver, is no exception. The film is intensely visual, with a kind of stream-of-consciousness style, especially around the beginning, and benefits from an outstanding performance by Tilda Swinton as the complex Eva. Eva seems alternately like a bad mother and all-around ice queen and a woman trying to do best by her family, and one must wonder if her memory (and by extension, the whole movie’s narrative) is reliable as she paints a terrifying portrait of Kevin literally from babyhood to present day. The movie asks the question of whether we can always blame the parents of these children for the kids’ evil actions or if some youngsters are just bad eggs. The answer to this question is often ambiguous here, but ultimately we decide that no, we can’t ultimately blame Eva for how ‘widdle Kevin’ turned out. It brings up the aged-old question of ‘nature vs. nurture’ in a new and interesting way, and packs a hell of a wallop in the process. This movie will make you think twice about going off the pill and make you wonder if having a little ball of joy of your own is overrated. The part near the end of the movie at the school when Kevin’s plan goes full circle makes me think of a extra I saw on my parents’ DVD of the original Halloween. Donald Pleasence, who played Sam Loomis, told the director that he could play the sequence when Myers falls out the window after getting shot and somehow escapes into thin air one of two ways; ‘Oh my God, he’s gone’ or ‘I knew this would happen.’ Ultimately they decided on the latter because the former would be, well, too much. That’s what I think of when I see Eva’s expression as she eyes the bicycle locks Kevin previously ordered in the mail on the doors of the school auditorium. Her expression is less a look of shocked horror as it is a look of resignation. I knew this would happen. On one hand, you wonder why Eva didn’t get her son major psychological help right off the bat, but on the other, could she really of prevented Kevin’s insanity if she had? After all, when you have a blissfully ignorant husband who refuses to believe your son has a problem, how are you going to get an evaluation carried out without his blessing? All in all, We Need to Talk About Kevin is kind of like watching a train wreck, albeit a visually striking one with a handful of outstanding shots. It makes us women, whether we plan to be mothers or not, wonder how far maternal love goes and if you can be held culpable simply for not loving your child enough. Is it possible to love a monster? I think so. People do it all the time. But for someone like Eva who obviously didn’t want to be a mother in the first place, her failure to love her son was ultimately ammunition for her evil child to use against her. Eva’s coldness is not an excuse for Kevin’s behavior anymore than Kevin being a difficult baby is an excuse for Eva to make very little effort with her offspring. One persons’ blame does not cancel the others’ out. But that’s not enough for other parent not to convince themselves that they could do better. Given the circumstances, could you? I know I’m probably a little late getting onto the bandwagon, but Judi Dench is an amazing actress! Her eyes are like twin oceans that reflect her character’s feelings, whether stormy or sunny, to an absolute tee. And although some people might find Stephen Frears’ biopic drama Philomena trite or predictable, I thoroughly enjoyed and it’s touching tribute to motherhood. 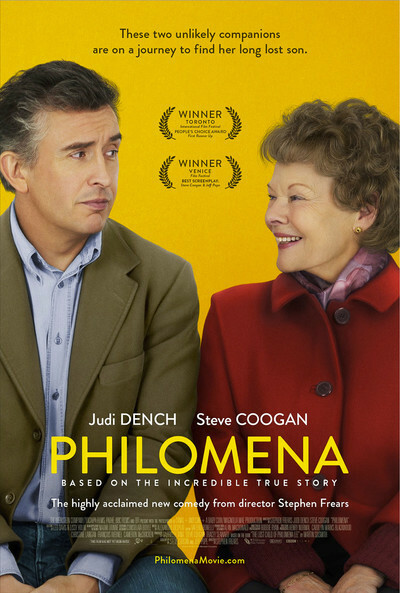 Philomena Lee (Judi Dench) is a simple woman- kind, a little eccentric, and privy to the simple joys that life provides. What she lacks in worldliness she makes up for in good cheer and her big heart. But something in Philomena’s past haunts her well into her twilight years. As a girl, Philomena had a little boy named Anthony who was taken from her and given to an American couple by the nuns that kept her as an indentured servant to work off her sins as an unwed mother. Not exactly living out the example of Christ, these nuns have refused to tell her over a span of dozens of years what became of Anthony, and despite being the mother of another grown child, a daughter, Philomena’s heart aches to discover Anthony’s whereabouts and to involve him in her life. That’s where Martin Sixsmith (Steve Coogan,) a disgraced journalist, comes in. Against his own better judgement, the cynical Martin is recruited by Philomena’s daughter Jane (Anna Maxwell Martin) to locate Anthony and reunite him with his aged mother. Thus, begins a funny, sad, and bittersweet journey to Ireland, Philomena’s birthplace, the U.S., and finally, home again (hopefully with son in tow.) On the way Philomena challenges Martin’s atheism and grim viewpoint on life in general, and Martin is gradually buoyed by Philomena’s infectious attitude. If you enjoy well-acted, gently quirky and sweetly predictable British dramedies that showcase the best humanity has to offer and heart-tugging plots, this movie is for you. I know what I like, and I’ve always enjoyed these kinds of movies, which seem soft and cozy enough to lull you to a peasant catharsis but real enough (compared to their U.S. counterparts) to take seriously. They’re the movie equivalent of comfort food, with laughs and tears along the way. “Philomena” is sad, but not in the nihilistic soul-crushing way a Von Trier movie is sad. It is funny, but not in the way a crude teen comedy is funny. It has just enough reality to make you think and just enough fantasy (like the prerequisite and entirely fabricated scene where Coogan gives his speech about decency and basic human rights to the geriatric, cold-hearted nun (Barbara Jefford) that sent Philomena’s son away in the first place and not an eye is dry in the house) to be warm and familiar, like a well-worn blanket. Yet, despite the familiar territory and the paper-thin supporting characters (Including Game of Thrones‘ Michelle Fairley as Martin’s implausibly soulless editor, and Martin’s wife (Simone Lahbib), who appears at the beginning to complain about his emotional unavailability and scarcely seen or heard from again), the movie works, and contains a handful of genuinely touching moments that will move you to tears. If “Philomena”‘s intent was to move me, it has duly succeeded. If it’s intent was, also, to make me curious about the real Martin Sixsmith’s book, ‘The Lost Child of Philomena Lee,’ it has succeeded in this regard too. 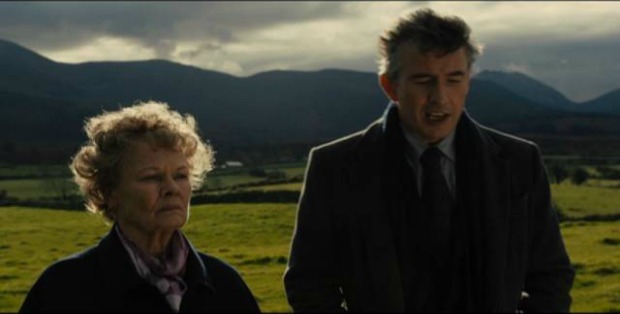 “Philomena” won’t rock anyone’s world with particularly innovative filmmaking and storytelling, but can’t us softies have our comfort food to watch as well as to eat and drink? For a taste of bittersweet, heartwarming, and maybe a little formulaic British cinema, look no further. 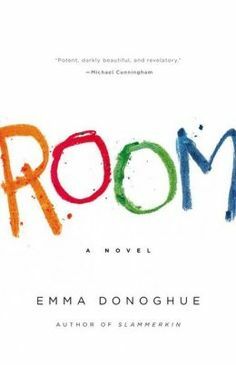 Resourceful youngster Jack is the dynamic protagonist of “Room,” a compelling offering from Irish writer Emma Donoghue. The initial premise of “Room” is at once heartbreaking and luridly fascinating- 5-year-old Jack and his mother, known merely as “Ma” for the duration of the novel, are prisoners at the hands of “Old Nick,” the psycho pervert who abducted Ma when she was a freshman in college. Jack has never left the small shed where he lives with his mother and is visited nightly by old Nick. who continually violates Ma while Jack hides in the wardrobe. Despite his potentially traumatic upbringing (he has never come into contact with another person and believes that the outside world he sees on the television is imaginary,) Jack is sustained by his Mom’s love and manages to be innocent to most of the more horrific implications of his life. He has had a troubled childhood, but possesses a soul both intrinsically healthy and capable of giving and receiving love. The dynamics shift when Ma starts having a reason to believe that her and Jack’s lives are in danger, and in her desperation, she calls upon Jack to help carry out a daring escape plan. “Room” is narrated by Jack, who believes in the sentience of inanimate objects. Because of this and Jack’s youth, the book is written in fragmented, often confusing phrases. If you can handle the broken English, however, “Room” is a arresting and heart-pounding piece of fiction. Emma Donoghue has a way of making potentially horrifying subject matter beautiful rather than sleazy. “Room” reminds me of “The Lovely Bones” in that way, treating the subject with lyricism and compassion rather than ickiness and shock value. I found Jack’s voice to be mostly plausible, with very few exceptions. There were only a couple of moments where I felt he was too precocious for a young child of his situation and the prose tipped me off that it was merely an adult telling the story. Ma’s the truly remarkable character in this novel though. Building a life for her son under horrendous circumstances could not have been an easy feat, and Ma loves the child of her abductor with an intensity and devotion that is inspirational, to say the lest (although I never expect to find myself in that kind of situation.) Only in the scene where Ma is being interviewed on the talk show does the book get a bit preachy. Mostly, though, it is Jack’s strong and idiosyncratic voice that propels “Room” beyond general ‘ripped-from-the-headlines’ fodder. Grappling with issues of motherhood and media sensationalism, “Room” is a profound and heart-grabbing read.